If you are looking for a reliable roofing solution, look no further than Spray Foam Systems for the latest roof coating sprayer systems. After application, these innovative sprays on roof coatings fully protect from weathering, water, UV reflection for energy savings, fix leaks, and fill gaps. Designed to prevent future damages and minimize maintenance, these spray-on roof coatings are second to none. Whether you are in or looking to get into the roofing or spray foam insulation industry, we have the best package and mobile roof coating sprayer systems for all of your coating projects. If you are unsure which system is best for your needs, contact one of our experts today. The X-70 Xtreme air powered spray system is a high pressure air operated airless spray system that is sure to boost your applications productivity. This system comes complete with Xtreme Duty hose and XTR gun that can handle the toughest coating tasks. The GH-933 is the most powerful gas hydraulic airless sprayer in the industry. This system comes complete with gun and hose needed for maximum performance and versatility for roof Coating applications. 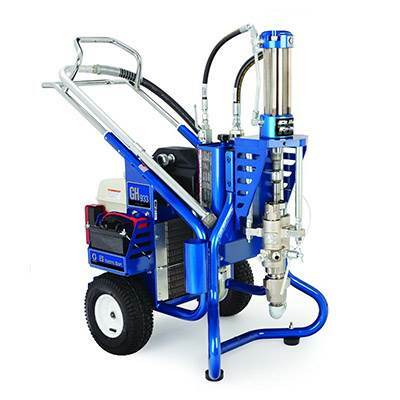 The PC2 Mobile Spray Rig is a turnkey system that features the GH-933 gas powered hydraulic sprayer. The ProPAK PC2 can handle over 300 feet of hose to conquer any roof coating application.